2018 has hardly got off the ground, but this Newsletter is already packed with new developments! As every year, at the end of January the bright California sun in Anaheim will shine down on the NAMM Show, presenting the hottest trends and new products in the MI industry. And one of them is our Passive DI Box. Now completely redesigned, it even has a new name to go with its sleek new design: DX10. The new DX10 will make its debut at the NAMM Show in Anaheim, California. 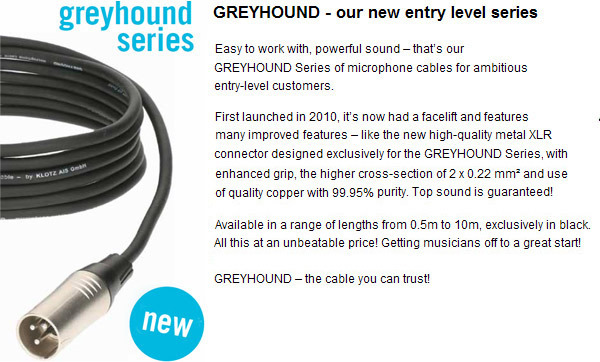 Our GREYHOUND entry-level cable series has also been redesigned, but retains its prime characteristics of being easy to work with and delivering powerful sound. Nils Westerwelle, previously our Area Sales Manager for Europe and South Germany, has taken over as Sales Director Germany & CEE from 1 January 2018, and now oversees sales throughout Germany and Central/Eastern Europe. We wish him every success and a smooth start to his new duties! February will see us heading for our next trade show, the ISE (Integrated Systems Europe) in Amsterdam. The exhibition is THE leading trade show for systems integration in the audio-visual sector. We’ll have plenty of exciting products from our ProAVM range along – come and visit us at our stand! We can boast over 30 years of experience in manufacturing DI boxes. In fact, we launched our first passive DI box all the way back in 1985! A huge success from the start, it was continuously updated and advanced in step with developing technology. In 1992 we added active DI boxes to our catalogue and revised the design. Further design revisions and improvements were introduced in 2010. Throughout the years, our DI Boxes have been permanent fixtures in our customers’ pro equipment line-ups. Now the 2018 NAMM Show will see the debut of our new, completely redesigned DX10 DI Box to a trade and pro audience. The relaunch of the DX10 heralds a whole new series of KLOTZ DI Boxes. The successor to our classic D10KL, the new DX10 offers all the best features you could wish for from such a vital element in live and studio performance. We’ve given the ultra-rugged, ready-for-the-road housing a stylish makeover and used only the best-quality components. The best thing about the DX10 is also the most important part of a DI box: the transformer. This transformer is an all-new in-house development that brings together all our expertise and experience. It is made from mu-metal, a soft magnetic alloy with outstanding magnetic permeability. In practice, that means incredible sound quality and clean sound – no more fuzz or distortion! Visit us at our booth at the NAMM Show 2018 and experience our new launch of Direct Injection products live! KLOTZ DX10 features clear-cut design and easy handling. No bells and whistles – it has exactly the functions that are needed and is made from top-quality components. Watch out for the all-new KLOTZ DX10! As every year, at the end of January the bright California sun in Anaheim will shine down on the NAMM Show, presenting the hottest trends and new products in the MI industry. And one of them is our Passive DI Box. Now completely redesigned, it even has a new name to go with its sleek new design: DX10. The new DX10 will make its debut at the NAMM Show in Anaheim, California, from 25–28 January. Our completely revamped exhibition booth will present new products from the MI and ProAVM industries – and, as you’d expect in the musicians’ El Dorado of California, some of our endorsers will present exciting live performances. Already on the programme are Jessica Lynn, Irene Ketikidi and Bobby Keller. We’re excited to see who else will turn up at our booth 5825 in Hall D.
What you’ll definitely find is a huge selection of products from our catalogue, including our premium TITANIUM Cable and the Signature Cables RockMaster, FunkMaster and Joe Bonamassa Signature. We’ll also bring along RamCAT products for network solutions and our versatile TrueLink, StraightLink and CatLink Stage Boxes. As well as the product displays and shows, there will also be plenty of time for gear talk and in-depth discussions. Visit us at our booth – our colleagues at the show look forward to meeting you! And of course, we’ll be happy to arrange an individual appointment if you wish. The NAMM Show will hardly be over before we pack our bags again and set off for Amsterdam. From 6–9 February, the city’s RAI Exhibition Centre will host ISE – Integrated Systems Europe, Europe’s leading trade show for AV systems integration. Our all-new trade show stand will also be along. Now providing an even more effective display backdrop for our CI and product portfolio, it features a striking and attractive design that makes us easier to find in the often crowded exhibition halls. Our products fulfil all the needs and requirements of professional AV environments. Displays will include RamCAT network cables and matching CATLink multicores, mobile HD SDI transmission solutions, fibre-optic multicores like our SmartBeam OCTO Distribution System, and a complete MIS (Modular Interface System) setup with sub-multicore and splitter. A whole 32 channels – and so compact and versatile! Our team will be on hand to answer all your questions. Of course, you can also arrange an individual appointment in advance if you wish. Come and visit us at Stand 6 N140. We look forward to meeting you! Nils Westerwelle has been with KLOTZ AIS for nine years – but part of the ProAVM industry for much longer; from 2003, he worked in equipment planning for major event locations, and even stadiums. From 2009 Nils Westerwelle was our Area Sales Manager for Europe and Southern Germany, with responsibility for the MI and ProAVM (Rental and Installation) sectors. 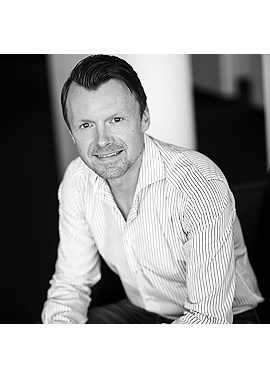 He took over the position of Sales Director Germany & CEE from 1 January 2018, and now oversees sales throughout Germany and Central Europe. We wish him every success and a smooth start to his new duties!